BRANFORD MARSALIS QUARTET "Four MF's Playin' Tunes"
I came up with a concept that was easy to explain, but understood that it might be hard to visualize, since the whole hook played off the camera’s shutter speed. The idea was to feature each member, starting with Branford, seated in a simple chair against a white seamless backdrop. Then, behind him, the other three band members would hustle in and out, constantly walking and moving behind Branford. The photographer, Eric Ryan Anderson, would then focus on Marsalis, sitting extremely still, and utilize a very slow shutter speed so everyone else would be a blur. I thought this perfectly represented Branford’s idea of this band. To fully illustrate that each person, at some point, stood at the center of the music, we had each member take his turn “in the chair,” while the former subject joined in the blur of energy in the background. It was awesome, simultaneously one of the most fun — and most stressful — shoots I’ve ever worked on. The very nature of the concept was random; you simply couldn’t tell what you were going to get, but thank goodness for the digital age. Laptops gave us real-time updates where we could make adjustments instantly; this would have been a nightmare, if not impossible, with film. Eric Ryan Anderson was brilliant, and the band was tireless in our pursuit of what we were looking to execute. Knowing we had achieved what we wanted, we celebrated and called it a day. We took a TON of pictures, and although many weeded themselves out for various reasons — people had walked out of the frame, the subject at the center had moved and was also blurry — we had lot to choose from, and everyone found a shot of themselves they liked. For once, we did not have to find a single photo of four people, where all four people were happy with how they looked! As I laid out a series of approved photographs, I had an idea on how to further the metaphor of Branford’s vision of the band. Since they were ALL integral to the band, why not make a booklet where you could fold it in a way that each band member could be on the cover? By reproducing the title of the record on each panel, this could be easily accomplished — and, boy, did the rhythm section love this concept! Although the record did not yet have a title, I mocked it up with some dummy type and worked with our printer to get a fold that could accommodate this concept. It was very cool — perfect “conceptual continuity” to quote the late, great Frank Zappa. Now…about that title. The shoot was over, the design work nearly finished, but there was still no title for the record. There was a conference call with Branford, his management/label reps, and myself and, after much discussion, Branford was exasperated and said “I don’t care what you call it. Call it four motherfuckers playing tunes.” The call ended shortly after that, but I could not get that potential title out of my head. It fit *perfectly* and after some discussion, a censored version got the official go ahead. There was still one more piece to complete; the tray card. That piece can fill up quickly, with the tracks and times featured, and the necessary evils of logos, legal lines and the UPC shoehorned in. It simply doesn’t leave much room for graphics, particularly if you’re looking at a full band shot. Combing through the photos, I was struck by a singular image, likely a throwaway shot simply to check lighting and framing. It was the lone chair that quietly shared the stage with the quartet, in stark light against the seamless background fabric. Not only did it offer lots of negative space to accommodate all of the type, it presented a beautiful idea to me. After the shoot was over, it was the last thing standing, and for my concept of the revolving group energy around each musician, it offered up the metaphor of being the musical document left behind from the band, their recording sessions, and the photo shoot. 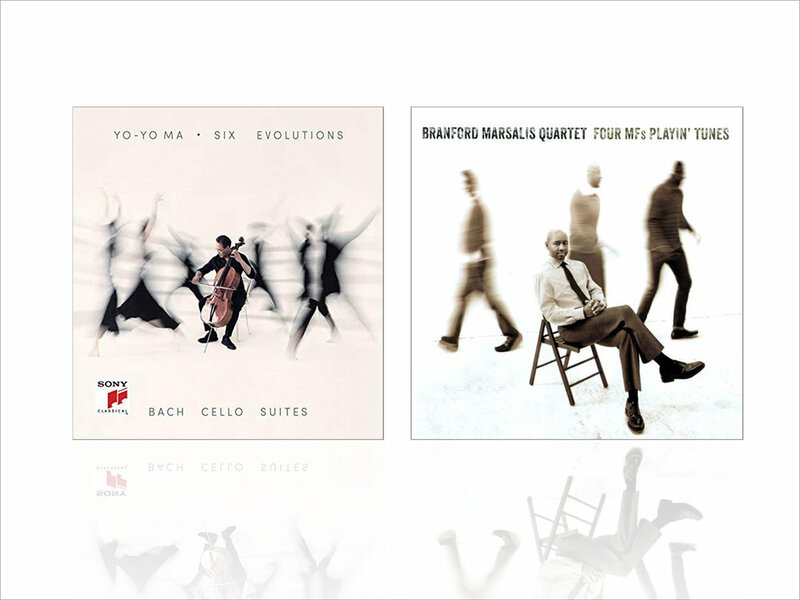 I’ve recently come across Yo Yo Ma’s latest release “Six Revolutions: Bach Cello Suites” and did a double, triple and quadruple take. I thought, “That’s my cover for ‘Four MF’s! Right down to the simple chair!” I put a lot of conceptual thought into this project and can’t help but wonder what the thought process was behind the Ma cover. They say imitation is the sincerest form of flattery, but, man…I can only hope it’s an homage of some sort and not just co-opting the concepts and ideas I brought to bear for the “Four MF’s…” project. Damn! BRANFORD MARSALIS/JOEY CALDERAZZO "Songs of Mirth and Melancholy"
Branford Marsalis has always provided his music to me in advance and asked me to "design what you hear." Believe me, those words are an art director's dream; that level of trust is really hard to find. But it also places an enormous responsibility on your shoulders; you really want to make sure you get it right. This project was a collaboration with longtime Marsalis pianist Joey Calderazzo and presented a unique challenge; to my ears, the music was incredibly "open" and sparse, with lots of space around the two instruments. At the same time, there was a very obvious familiarity between the two musicians, and that closeness also informed the music. I was intent on somehow capturing and conveying these two disparate concepts on the cover. I knew the focus, or part of it at least, would be on Branford and Joey. I came up with the idea of using scale to represent the openness of the music; the familiarity aspect would have to be provided by the two musicians. I mocked up some very detailed computer sketches for Branford to help visualize and explain my concept using stock art and models. With a preliminary green light, I started looking for locations with high ceilings and a unique, ambient vibe, as I did not want the musicians to be overwhelmed by their surroundings. I found a warehouse space in South Boston for the shoot, and it was perfect; a giant, empty space with concrete floors and a huge brick wall painted white. I knew the musicians would just pop right out of that background. Unfortunately, that plan fell apart at the last minute. I discovered that the photographer for the shoot, Boston-based Stephen Sheffield, had a connection to the Museum of Fine Arts in Boston. The museum had just recently opened the new Art of the Americas wing, which featured a beautiful, massive granite wall. We negotiated to do the shoot on a Monday holiday. However, a holiday meant more visitors and we had to start the shoot at 6 a.m. to be finished when the museum opened to the public at 9 a.m. Working musicians seldom like a call time that early, but we were running up against a tour, so Branford and Joey, knowing our time constraints, were game. The space was lit by skylights, which meant we did not need to set up any additional lighting and could move quickly. Sheffield and I started marking off spots on the floor for the musicians to stand and began framing the shot. Sadly (predictably? ), my tight script just wasn't working; I had pictured the musicians at either corner of the frame, walking either toward or away from each other. Unfortunately, it lacked the energy I was seeking and looked "too" staged. Thank goodness for digital cameras tethered to laptops so you can see the shoot in real time! Meanwhile, Branford and Joey started goofing around and cracking jokes. Sheffield was ready and snapped the singular shot that became the cover There were no others like it because Joey had just said something that made Branford laugh. If you look closely, Branford is covering his mouth and Joey is looking off to the side so that he, also, wouldn't start cracking up. ONE shot. And there you have it...that "thing" we were missing; that "thing" that gave a human connection to the scale and space concept. The poster really accentuated the spatial concept, due to not being constrained to a square format. By the way, Branford was also more than capable of being a cutup, and both the musicians kept the shoot quite loose as Sheffield and I fine-tuned ideas on the fly. See the outtake above left. In retrospect, I think Branford and Joey's personalities were key to the success of the shoot, and the body language on the back cover illustrates those split-second moments that work. I have always looked to some of the classic Blue Note covers for inspiration. Reid Miles and Francis Wolffe really changed album cover design with their interesting use of size, scale, perspective and, of course, their simple yet beautiful typography. This was my guide — and goal — for this album cover, and "Songs of Mirth and Melancholy" remains one of my favorite covers I've worked on. ALISON KRAUSS + UNION STATION "Lonely Runs Both Ways"
Alison Krauss + Union Station’s Live came out in 2002, and I was fortunate to have been able to work on the vinyl, CD and DVD releases as one of my first projects as Creative Director for Rounder Records. Many people will tell you that live albums are often a placeholder in an artist’s catalogue, whether they be great, awful or somewhere in between. From an art director’s standpoint, that’s certainly true, as the visuals often focus on the “concert experience” and mostly rely on live photography. The goal is often to create an authentic and permanent souvenir for the fan base. Studio albums, however, are a whole ‘nother animal, where concept is often king. For the follow-up to the live release, Alison and her camp came back to us with the idea of doing a photo shoot of the band in one of the old dressing rooms of Nashville’s famed Grand Ole Opry. On paper, it was a brilliant idea that would delight her fans and catch the country music world’s attention. In reality, it was unworkable. A typical dressing room at the Grand Ole Opry. Rounder had many contacts in Nashville — in fact, it was where Alison was living at the time — and we soon learned that the very charm of these old theaters were precisely the problem with our intended shoot: the theatres may be “intimate” for concerts, but the dressing rooms are simply small and cramped. There was no way to get a five person band, a photographer and assistant, a makeup and wardrobe person and light rigs into these incredibly cool, but incredibly small spaces. What now? "Our" dressing room on the LP/CD back cover. The decision was made to rent a warehouse space and build a set to match the look and vibe of the dressing rooms of Nashville’s grand ol’ dame. I assumed a general contractor skill set, working with carpenter unions, insurance binders and set decorators, and laying out milestones in advance of the shoot. I was ecstatic when I received rough pictures of what it looked like — everyone involved did an amazing job. Take a look at the detail on the walls of “the dressing room” on the final cover. World-renowned photographer Norman Jean Roy shot the cover and all of the incidental photography for Lonely Runs Both Ways. In group photos, it’s often difficult to get a shot where everyone looks good. Not everyone was happy with their shot, so there had to be some minor retouching; one band member’s head was replaced with a head from a different shot and a pair of eyeballs on another member was also swapped out. With the majority of the musicians happy, this was the simplest, easiest and best route to go and it looks seamless. Norman Jean Roy’s photography throughout the booklet brilliantly extends the illusion of a band hanging out before or after a show. I thoroughly enjoyed working with Alison. She was never less than lovely and complimentary and one of my favorite memories is seeing her sing the national anthem at Fenway Park. In overalls. Pure Alison. The cover of Lonely Runs Both Ways, in my opinion, stands as a visual reminder to the fact that Alison Krauss + Union Station were always a band — a great band, in fact,— and not merely a singer with backing musicians. CARLY SIMON "Never Been Gone"
In the summer of 2009, I was approached by a friend and former colleague who also happened to be a musician and producer. He asked if I might be interested in working with a new client of his to execute her vision for the cover of her new album. I could, of course, bring whatever I wanted to the table for discussion, but she had something very specific in mind and my job would be to realize that. Of course I was interested and that’s how I came to work with Carly Simon on her album, Never Been Gone, a quiet, low-key reinterpretation of some of her greatest songs. Carly Simon is one of Martha Vineyard’s most famous residents. The fact that I also had a summer residence there certainly gave me a foot in the door — credibility, perhaps, but an easy and delightful commute for sure. Our first meeting, and all of the subsequent work sessions, were done at Ms. Simon’s house. She laid out her idea to me; she wanted the cover to literally interpret the album’s message of re-examination, and showed me a photograph taken by her husband. It was a close-up of Ms. Simon looking through a magnifying glass. And though I would provide alternative layouts, that photograph would, in fact, become the cover. Throughout our work sessions, which would often be held on the porch overlooking apple orchards and horses, Ms. Simon was volunteering and riffing on ideas at a machine-gun rate. Her sketchpad came out as she hand drew the type as she wanted it to appear on the cover. As pastels and pencils of different colors filled in the type and made drop shadows and flourishes, I knew this was going to be a bit of a challenge from a production standpoint. I’ve learned not to bore artists with details; most don’t care how you get there, as long as you get there. Ask any producer, who’s tasked with getting a specific guitar or drum sound. But I watched as Ms. Simon created very ornate and detailed sketches; my mind was simply working out how to separate the layers and colors and then recombine them in the digital world (bitmapping and transparency issues, for those that care). She put an asterisk next to her favorite, and I was happy to eventually present it to her, seamlessly integrated into the final cover design. the rest could and would be done back home in Boston. The ferry ride home after those sessions was a bit surreal. I thought it might be interesting to discuss the creative process behind some of the album covers I have worked on. As Rod Stewart famously said, "Every picture tells a story...."